People walk to a lot of places on East Colfax — East High School, the state capitol, restaurants, music venues, stores, and community centers — but there aren’t enough places to cross the street safely. Colfax is designed primarily to move tens of thousands of cars each day, and that’s what makes it one of the most dangerous streets for walking. Denver Public Works recently made walking (and biking) on Colfax a little less nerve-wracking by signalizing the intersection at Steele Street. Steele is midway between two other signalized crossings at Fillmore and Adams, which are more than a quarter mile apart. So before this new signal was installed, people on foot had to go out of their way to find a crosswalk where cars would come to a full stop. Pedestrians can push a button to trigger a walk signal without waiting for a full light cycle. Steele is a north-south bike route interrupted by Colfax, where cyclists have to follow a half-block jog on the sidewalk to continue. 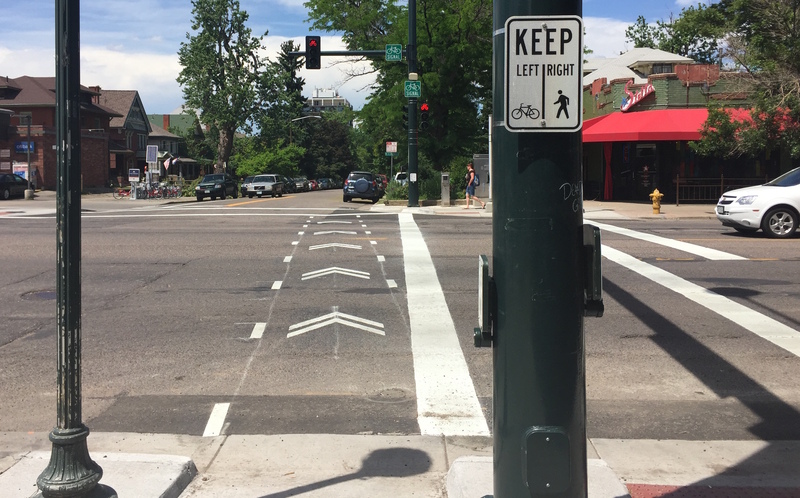 The new intersection treatments include markings across Colfax for northbound cyclists, and Public Works will install a bike box on Steele for southbound cyclists, with a camera that will trigger a green light when it detects a cyclist. The signals are something the city can do relatively quickly to make this intersection more tolerable for people walking and biking, but it will take more than a few tweaks to make Colfax safe. The fundamental problem with Colfax is that it’s too wide and drivers go too fast. Only a bold, thorough redesign can fix that. Could you link the city drawings for the intersection? Sorry John, don’t have them. Interviewed someone at DPW to get the details.